Koenig & Clinton congratulates Anoka Faruqee & David Driscoll on their participation in the DeCordova New England Biennial 2019. The exhibition opens this Thursday, April 5 and will remain on view until September 15, 2019. The DeCordova New England Biennial 2019, curated by Sarah Montross and Sam Adams, presents a survey of contemporary art of New England, showcasing compelling and ambitious art making in the region. The twenty-three artists selected for the Biennial are from all six northeastern states-Connecticut, Maine, Massachusetts, New Hampshire, Rhode Island, and Vermont. Featuring work across diverse mediums including painting, video, sculpture, photography, fiber art, and ceramics, the Biennial will occupy all galleries of the Museum and extend into the Sculpture Park with new site-specific commissions. Anoka Faruqee (b. 1972, Ann Arbor, MI) and David Driscoll (b. 1964, Steubenville, OH) are painters who began collaborating in 2012. Their complex patterned compositions explore the intersection of virtual and physical experience, layering misaligned patterns in paint to echo digital printing effects. In their most recent series of Circle paintings, light and dark contrasts create a topographic illusion as they build volume through meticulously juxtaposed use of light and saturated color. Faruqee earned her M.F.A. from the Tyler School of Art in 1997 and her B.A. in Painting from Yale University in 1994. She is an alumna of the Whitney Independent Study Program and residencies at the Skowhegan School of Art and the P.S.1 National Studio Program. David Driscoll earned his B.F.A from Ohio State University in 1987. They live and work in New Haven, CT.
For further information please contact info@koenigandclinton.com or call (212) 334-9255. Hours of operation are Thursday-Saturday, 11AM-6PM and by appointment. 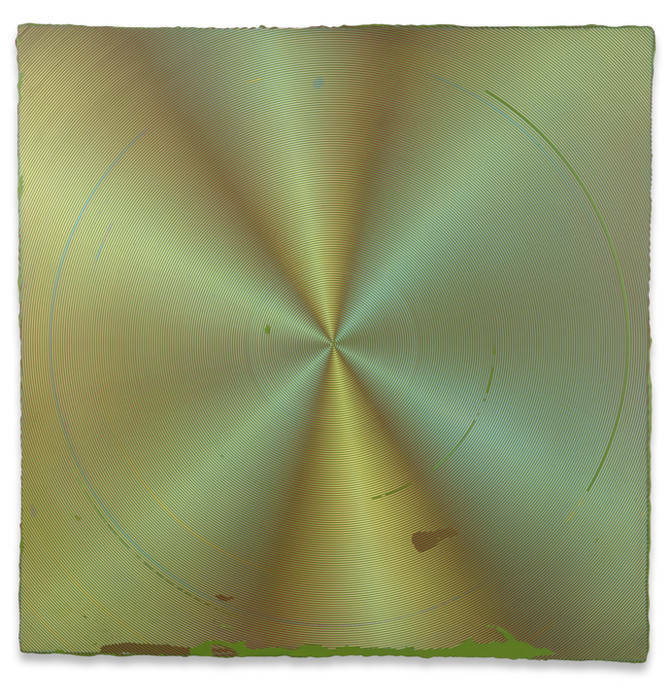 Anoka Faruqee & David Driscoll, '2019P-13 (Circle)', 2019, acrylic on linen on panel, 45 x 45 in (114.3 x 114.3 cm). Photo: Kanthy Peng, New Haven.